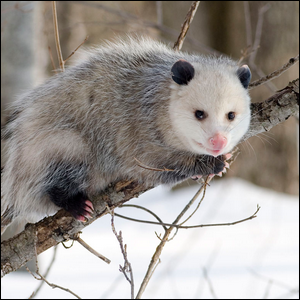 The Virginia opossum, commonly called just the “possum”, is found not only in Virginia in the United States, but throughout most of North America. Distinct face and rat-like tail aside, the thing the possum is best known for is feigning death to avoid predation. In fact, the possum is so good at faking death—a maneuver called thanatosis, from the Ancient Greek word θανάτωσις, meaning “putting to death”—there’s even a colloquial phrase for it. To tell someone to stop “playing possum” is to tell them to stop pretending to be asleep or feigning an injury to gain an upper hand. While the possum’s defensive use of thanatosis is certainly the best known example (nobody says “Stop playing Pisaura mirabilis!” after all), there are other curious examples both defensive and otherwise in the animal kingdom. Hog-nosed snakes will secrete a foul fluid from their body and curl up, mimicking both the pose of death and the smell/taste of it to ward of predators. Numerous beetle species have been observed feigning death as a defensive measure too. The aforementioned mirabilis spider actually uses thanatosis during mating—the males play dead to avoid being eaten by the females. Perhaps the most aggressive version of thanatosis is found in “sleeper cichlids”, endemic to Lake Malawi in East Africa. The large fish will lay down on the lake’s bottom, shift their color to a blotchy pattern to mimic death and decomposition, then lay still. When smaller scavenger fish come over to investigate, seeking a cheap meal, the sleeper cichlid springs to life, devouring them. Thankfully, for those of us more familiar with the defensive thanatosis of the possum, possums will run away as fast as possible when they realize the gig is up and their feigned death is insufficient to deter us from investigating them.